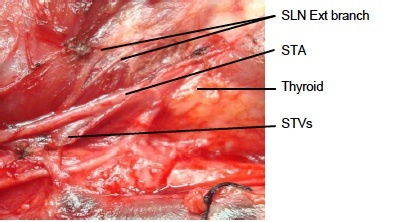 An incision is made in the skin two finger breadths above the sternal notch between the medial borders of the sternocleidomastoid muscles (two muscles make a V shape in front of the neck). 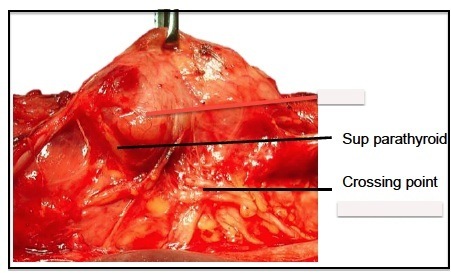 The width of the incision may need to be extended for large masses, or for a lateral lymph node removal. 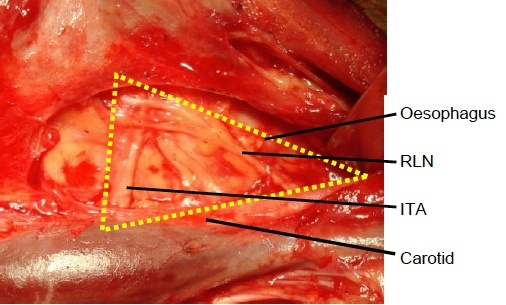 Subcutaneous fat and Platysma (triangle sheet of muscle at both sides of the neck) are divided, and a subplatysmal dissection is made above the incision up to the level of the thyroid cartilage above, and the sternal notch, but remaining superficial to the anterior jugular veins. 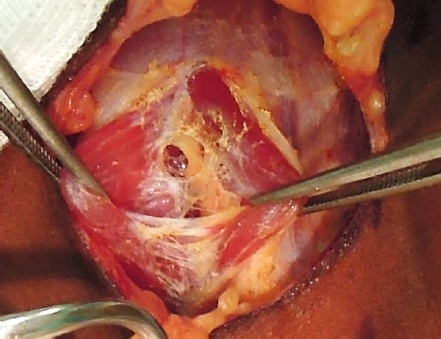 The fascia between the sternohyoid, omohyoid and sternothyroid muscles (strap muscles ) is divided along the midline and the muscles retracted laterally. 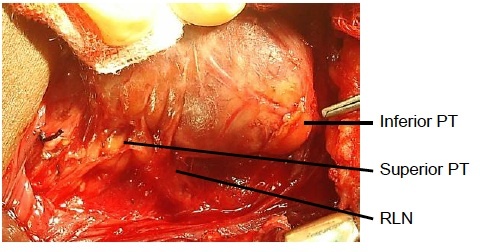 This is an avascular plane but care must be taken not to injure small veins crossing between the anterior jugular veins. 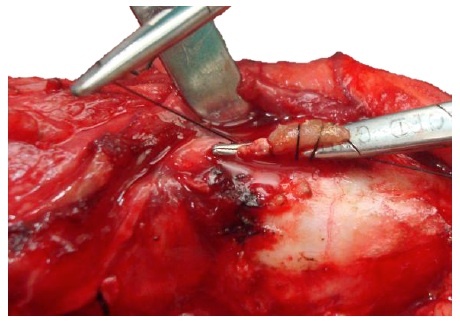 Strap muscles retracted laterally, fascia white tissue between them. 4. 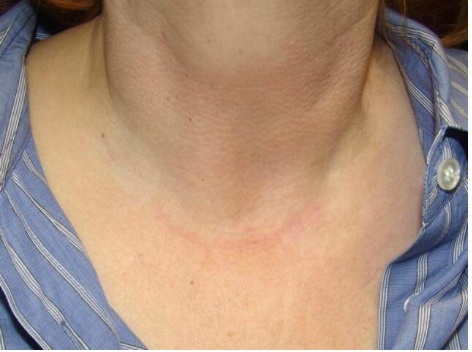 Identify the Middle Thyroid Vein. 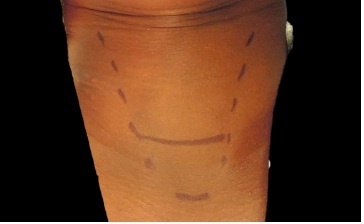 The thyroid gland is rotated medially (using the surgeons fingers). The important vascular structure to identify is the middle thyroid vein (it will be tightly stretched by the medial rotation of the gland), which is then ligated. This permits further mobilisation of the gland and moving the bulk of the lobe out the wound. 5. Identify the Superior Laryngeal Artery and the External Laryngeal Nerve. Identify the superior laryngeal artery as close to the superior pole of the thyroid parenchyma as possible. Great care should be taken while ligating the superior laryngeal artery so as to avoid injury to the external laryngeal nerve. In some patients the external branch of the superior laryngeal nerve lies on the anterior surface of the thyroid lobe. 6. Identifying Superior Parathyroid Gland. 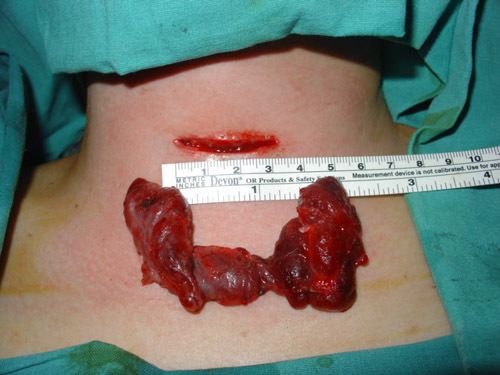 The superior parathyroid gland is normally located in a posterior position, at the level of the upper two thirds of the thyroid and approximately 1 cm above the crossing point of the recurrent laryngeal nerve and the inferior thyroid artery. It is orange yellow in colour, but is difficult to identify. The gland must remain in situ with blood supply intact. The inferior parathyroid glands are normally located between the lower pole of the thyroid and the isthmus, most commonly on the anterior or the posterolateral surface of the lower pole of the thyroid. Care must be taken to preserve it in situ and to avoid damaging its inferior thyroid artery. 8. Identifying The Recurrent Laryngeal Nerve. The recurrent laryngeal nerve is located between the common carotid artery laterally, the oesophagus medially, and the inferior thyroid artery superiorly. 9. Dividing The Thyroid Isthmus. When doing a thyroid lobectomy, the isthmus, which is crossing between the two thyroid lobes, is divided. 10. 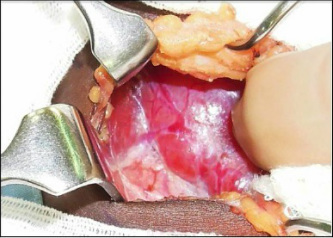 Removing The Thyroid Gland.